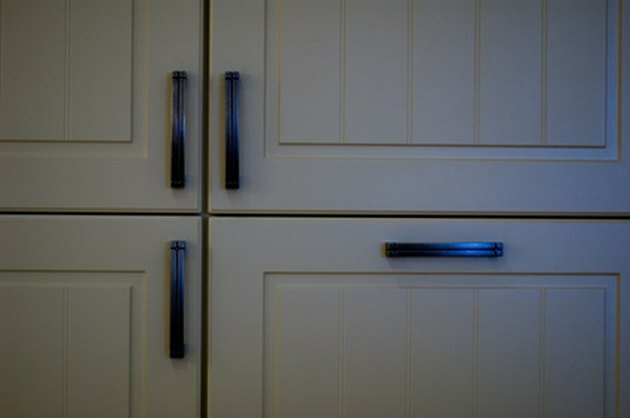 Many homeowners choose particle board cabinets when choosing kitchen, dining room and bathroom furniture. This is because particle board is much cheaper than solid wood and can have the same overall effect as expensive cabinetry. According to the Composite Panel Association, particle board is made up of variously sized cellulosic particles mixed with glue, then heated and pressed to create the finished product. Just because a particle board cabinet breaks does not necessarily mean a homeowner must buy new, higher-quality cabinetry. Broken particle board cabinets can be fixed easily with a few essential materials. Particle board cabinets can be repaired instead of replaced. Cut two pieces out of the flat areas of the plastic milk jug. Make sure the pieces are approximately the same size as the broken area. Place the broken piece of particle board onto the area of the cabinet it originated from. Place one plastic piece on the underside of the break and the other plastic piece on the top of the break. Hold the broken particle board steady. Clamp the broken particle board in place, keeping a layer of plastic between the clamp and the particle board. This will protect the clamp from sticking to the board once the glue is applied. Hold the cabinet upright with the broken area pointed upward. Then, squeeze the cyanoacrylate glue over the edge of the broken piece, completely saturating the area where the broken piece and the rest of the cabinet meet. The glue will run through the particle board, bonding it back together. Spray the area with an aerosol glue activator. Allow it to cure for about 30 to 45 seconds, or longer depending on the size of the break. Remove the clamp off and test the repair. If the area feels fragile, repeat the process. If the area feels strong, sand the area to smooth the particle board and get rid of any excess dried glue.